Holy banana pants! HerdCon was a BLAST to go to! I actually left for the show a day early: the organizers informed artists and vendors that the building had only one elevator. 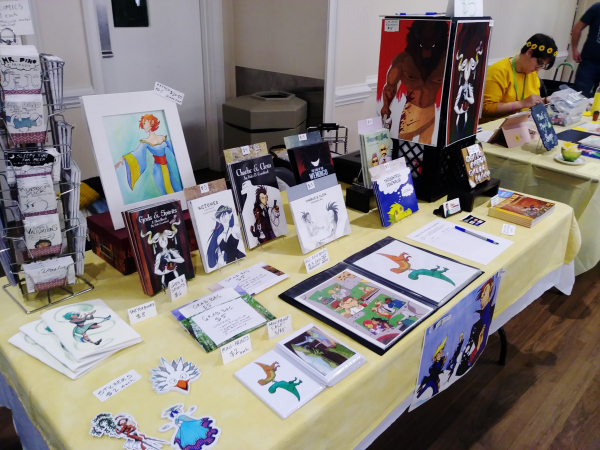 Because of that, the organizers suggested (pretty heavily) that we vendors and artists set up the day before the show, to prevent congestion on the morning of HerdCon. Which is what I did. As expected, the Friday before the show was pretty congested for set-up. 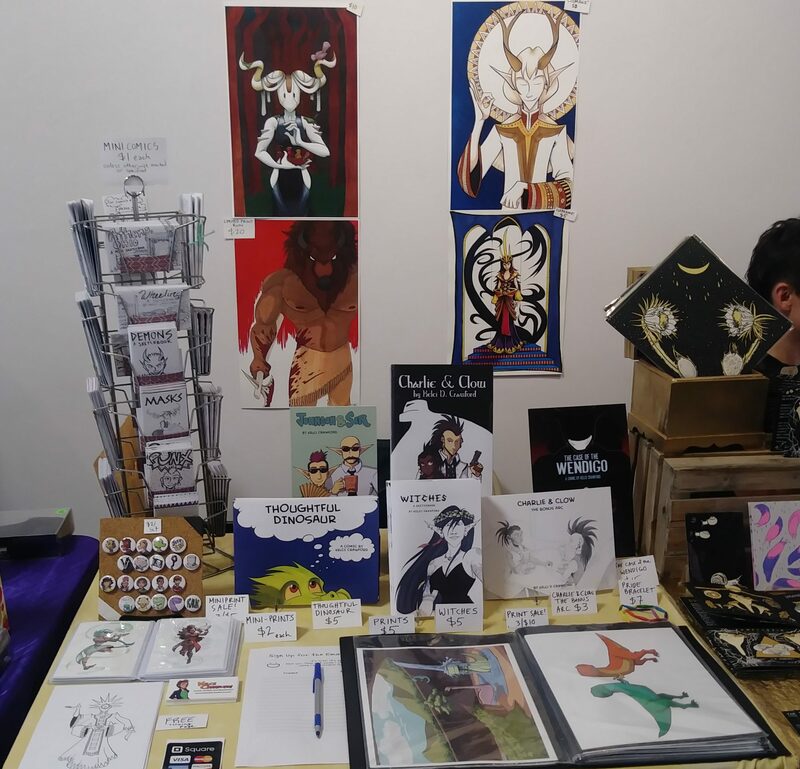 But it was still nice to take my sweet bippy time to get the table ready… instead of feeling the pressure to have everything all set up in an hour or less (which is what I’m used to with other shows). On the day of the convention, I wasn’t sure what to expect for attendance or sales. By the end of the day, it was the BEST sales day I’ve had at a one-day show since I started selling my work at conventions! The organizers knew what they were doing. They approached the show as a non-profit community event (as events like these should be treated, in my honest opinion). Their communications with the organizers was quick, thorough, and to the point. Plus they made lunch available for vendors for an extra $10…which I took advantage of. I got the veggie sandwich lunch (admittedly, I should have ordered the ham sandwich. But hey – lesson for next time). The show organizers promoted the HECK out of this show. They reached out to local press, updated their Facebook and Instagram accounts consistently, and offered freebies that would entice the audience they were looking for. I remember one Facebook post promoting a giveaway of free dice with the HerdCon logo as the highest roll number. If that’s not nerdy, I don’t know what is. I talked a lot about the show on my email newsletter, and got some peeps from previous shows to show up to visit. Thanks for coming! And thanks for putting up with my incessant talking about it. There were things on my table marked down for clearance. I know what it’s like to be a broke college student. Plus there’s a LOT of inventory that needed to be cleared out so I can make room for future books, prints, and stickers. So I marked all of my 8.5 x 11 prints down to $3 each – buy one get one free. And I had grab-bags. While grab bags didn’t sell as much, prints certainly did – I have only 4 designs left! I also did caricatures on the spot. I was surprised at how well caricature sales took off at Marietta Comic and Creator Con last year, so I thought to bring it here. The sales of caricatures alone made up for the cost of the AirBNB and gas to get to HerdCon. Would I go again next year? ABSOLUTELY. Should you go as an attendee next year? DOUBLE-ABSOLUTELY. Everyone I chatted with had a fun time, enjoyed the Artist Alley, and got to go to fun panels and play tabletop games. Fun times were had by all! I’m so tickled by how well this show did, especially since I mentioned in my previous post that I had been burned by inaugural shows before. So I’m happy to see HerdCon succeed! I hope it continues to do so.